Note: Copy personally purchased as they did not provide a review code. Due to this, any actual review will be delayed. I've been extremely excited about this one, since Theme Hospital is a game I sunk entire days into when I was a lot younger. 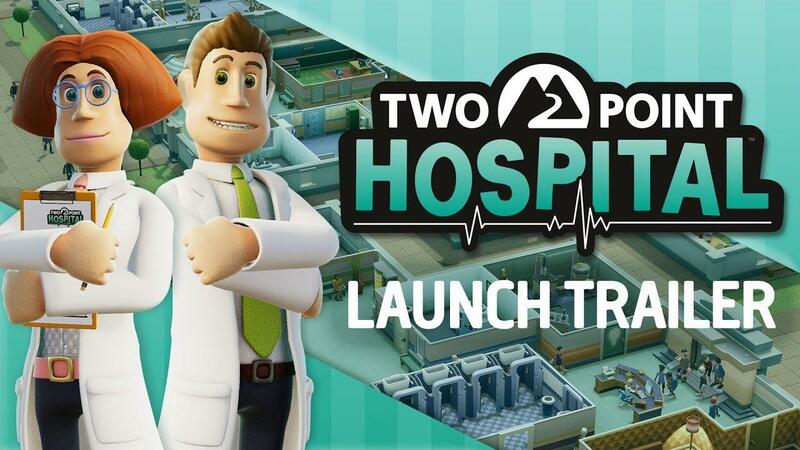 Two Point Hospital is carrying to torch here, as it's actually made by people who previously worked at Bullfrog Productions who made Theme Hospital. You will be building your hospital, hiring staff with unique personalities and traits and much like it's older brother, Two Point Hospital aims to be more on the comical side with some unusual illnesses requiring their own special treatment. I can confirm that it does launch and run, although you will be sitting with a black screen for about a minute on the first load. Subsequent loads are much faster—almost instant, so it's likely building some sort of cache. After that you will probably need to adjust the settings, as it defaults to low graphics and a low resolution. Seems to work fine when starting the actual game too, instantly looked just like Theme Hospital. I will have more thoughts up in future now it's actually out. Grumbles aside about no review key, I'm really happy to see Linux support at release! Tom B It's not working for me. Arch Linux nvidia 396.54, 980ti. Have you tested if it runs on the current long-lived 390.x driver? I have the impression that devs rarely test on the short-lived nvidia driver series. theghost Definitely on my buy list. I just need a few good reviews to convince me to get this in the next days. Seems like the developer didn't provide any press samples early up, there aren't any reviews available. Here: Two Point Hospital - Worth a buy? Guy is a bit of a prick, but his reviews are usually on point. Lord_Phoenix For me it crashes on start under Fedora KDE and nvidia 396.45 driver Getting tons of errors when running steam via terminal. KDE Neon (Ubuntu 18.04) here with Mesa drivers (18.1.6). It's running fine for me, just took a while to start the first time (you get a blurry window for about 30 secs.). The only problem are some artifacts while you move the camera, out of that, the frame rate and mechanics works fine for me at full graphics. EDIT: Ok, tested with 18.2RC2 at the artifacts are still there. Fortunately I figured out that they're generated by "Ambient Occlusion" option in the graphics setting. Disabling that feature all the artifacts goes away (I can play at max setting, only need to disable that effect). Definitely it takes some time to start the first time, probably because it compiles and creates a cache of shaders. I have only played about an hour so far, but it runs perfectly for me with nothing special needing doing (other than waiting out the ~30sec freeze on first start). Like Liam I spend a lot of time on the original theme hospital, even got a second copy so I could play over a LAN, and this really evokes the feel of the original for me. For me it's working like a charm. I also had the 30 second blank screen during the first start. In opposite to Liam my settings were already fine. The game directly launched in an high resolution (2560x1600) and all quality related settings were maxed. After 30 Minutes of testing everything seems to run fine and smooth at about 80 FPS. I'm running with nvidia 396.54-2 from the arch repos and NOT using wayland. What I'm wondering is that how the nvidia driver is working together with the game. X resolution is set to auto. My native resolution is 3840x1600. The game tells me it runs at 2560x1600 in full-screen mode. The Monitor is set to not scale/etc and show the input 1:1. However I get a sharp detailed full screen picture without borders. Scaling is also correct. So I think the nvidia driver or the control center is somehow overruling the game settings. Does anybody has a link to more information on that topic? Aside from some shadow flicker when moving the camera the game has been working fine so far. Really enjoying the game and it feels like Theme Hospital 2, I still enjoy the original but it's nice to have new around maps to play with. Does anybody know whether buying it from their homepage gives you a DRM-free copy, or just a Steam link? They don't say. Runs pretty well on my system (Xubuntu 18.4). No issues so far, except that VSync doesn't work again. But I use the corresponding option of the nvidia driver. I use a GTX 970 with NVIDIA Driver Version 396.54. I don't know if the golden toilet DLC was unlocked automatically or not, but I didn't find it until I logged into their website again after launch. You still need to unlock it in-game before you can use it though and it costs 50 unlock points. I haven't heard about that but probably issues were caused by the delay, not playing a bonus game. Valve doesn't allow to refund a game if it was bought more than two weeks ago even if that was a pre-order. This happened to me once. I had pre-ordered Armikrog, it was delayed for two months and then released as an unfinished broken piece of crap. I tried to refund it, and even if I was playing for less than an hour, I couldn't do this. That't why I don't pre-order games anymore.